In the summer of 2014, UTT scheduled a one-day training program for law enforcement in the Phoenix, Arizona area hosted by the Maricopa County Attorney’s Office (MCAO). The program was designed to teach police officers and investigators about the Islamic Movement in the United States and Arizona, and provide them with tools to help them identify and investigate the threat. The attacks against UTT and the MCAO were immediate. On August 14th the Muslim Advocates along with 75 other organizations sent a letter to President Obama’s Counterterrorism Advisor Lisa Monaco which called UTT’s training “bigoted” and asked the administration to re-train all law enforcement officers who have been through such training. The letter, signed by the ACLU’s legal director in Arizona, was also signed by the current and previous leaders of Hamas (dba CAIR) in Arizona (Imraan Siddiqi and Mohamed El-Sharkawy), the leader of the Muslim Brotherhood’s Muslim American Society (AZ), and the leaders of the MB’s Islamic Community Center of Tempe (ICCT) and Islamic Community Center of Phoenix (ICCP). The properties of the ICCT (1131 East 6th Street, Tempe) and ICCP (7516 North Black Canyon Hwy, Phoenix) are owned by the North American Islamic Trust (NAIT) which is the bank for the Muslim Brotherhood in North America. In the largest terrorism financing and Hamas trial ever successfully prosecuted in U.S. history (US v Holy Land Foundation, Dallas 2008), NAIT was identified by the Department of Justice as a member of the U.S. Muslim Brotherhood which directly funds Hamas, a designated Foreign Terrorist Organization. 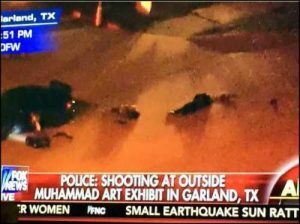 In fact, the two jihadis who attacked the Draw Mohammad competition in Garland, Texas came from the ICCP. Fortunately, they were killed before they could harm anyone. On September 19, 2014, 300 police officers from all over Arizona sat through approximately 8 hours of training from UTT which detailed the jihadi threat with facts and evidence. At the end of the program, when asked, all of the officers admitted they did not previously know the information presented, and all agreed the information is critical to protecting their community. So why did the ACLU, the Arizona media, and religious leaders join with the terrorist group Hamas (doing business as CAIR) to condemn fact/evidence-based training which law enforcement calls “critical” to doing their jobs and has led to investigations into terrorism matters being opened in Arizona? That is a fair question. This week, UTT finds itself in Louisiana training over 150 law enforcement officers from all over the state. Six days ago, attacks and threats targeting UTT and the host – the Rapides Parish District Attorney – came from the Southern Poverty Law Center (SPLC), Hamas (dba CAIR), the Associated Press and local media, and local Islamic organizations, including the Islamic Society of Central Louisiana. Yet, over 150 law enforcement officers now know, from reviewing facts and evidence, the Muslim Brotherhood has a massive jihadi network here in America. Police also now know CAIR was created by the U.S. Muslim Brotherhood’s Palestine Committee, which is Hamas in the U.S., and got to hear from UTT’s Vice President Chris Gaubatz as he shared about his experience undercover inside Hamas’ (CAIR) headquarters in Washington, D.C. Chris shared about retrieving over 12,000 documents from CAIR’s headquarters which revealed CAIR is involve in fraud, sedition, and terrorism. The police now know CAIR is Hamas. Chris also shared other experiences he had visiting mosques across America and what is being taught there. Another victory for the truth and for freedom. Now these officers will be able to take what they have learned back to the streets to identify real threats so they can use the full force of the law to protect their communities. What are the common denominators for the successes then and now? First is the power of UTT’s message, built on facts and evidence – real truth about real threats. Secondly, the courage and tenacity of leaders like Maricopa County Attorney Bill Montgomery and Rapides Parish District Attorney Phillip Terrell are an important key to these successes. These warriors are ensuring their citizens are well-served by the men and women in blue. Citizens of Maricopa County (AZ) and Rapides Parish (LA) should thank and support these men of courage. The hydra-headed bodies of false accusations & lies against UTT; the Maricopa County Attorney’s Office (MCCAO); et al, contained in the 13 August 2014 letter addressed to the former Mombasa-Kenya born Islamist impostor’s “counterterrorism” advisor in the White House, and subsequent ACLU demand dated 14 September 2014, also effectively on behalf of 75 diverse organizations et al, who were distressed to finally learn that UTT is not only on to the Muslim Brotherhood scams in support of a “Global Islamist Movement” seeking to destroy American freedoms – but clearly in hot-pursuit of federal indictments as well – were probably instigated by an article in the 04 August 2013 edition of the “McClatchy Company”(s) twenty-nine newspapers; (see company’s Wikipedia page & read-on). I.e. citing “anonymous sources” said publications reported conversations between Al Qaeda’s new leader, and the leader of Yemen based Al Qaeda in the Arabian Peninsula, discussing an imminent terrorist attack, I.e. a conversation with respect to which, two days previously, the New York Times (believe it or not) had agreed to withhold the identities of both “leaders” after U.S. Intelligence operatives had claimed that to do so could jeopardize prevention. Subsequent interviews of officials by the New York Times are alleged to have characterized said McClatchy editions as more damaging to U.S. counterintelligence efforts than whatever it was that Edward Snowden is alleged to have done; which we know didn’t include license to blithely spit in the face of RICO indictments by virtue of elitist immunity, federal malfeasance, and/or criminal collusion, as prominent others have consistently managed to do. Thus, the McClatchy “Kansas City Star” headline dated 02 March 2017 which appears on the Drudge website today (12.03.17) I.e. : “FBI Undercover Stings Foil Terrorist Plots – But of Ten Plots of the Agency’s Own Making”, though in the narrative limits said reckless assertion to the States of Kansas & Missouri (the FBI is a “Bureau”, not an Agency), in view of what appears to be an incremental McClatchy crusade on behalf of an illegal on-going sharia-adherent invasion in order to delegitimize & propagandize the FBI at every step of the way to thus justify its national assault on the bureau which began on 04 August 2013, and to which, I believe, both foregoing referenced letters of complaint were collusively threaded before being written. Foregoing partially paraphrased from Wikipedia data. Add the word “not” between the words “to” and “do” – on line six (6) of paragraph two (2). It is good to see that there are people out there doing the best they can to inform people of the Islamic threat. I have been trying to do this in England for 40 years. The few people I met in the CIA and DOD and NSA were with me on it. I believe still Obama is a Muslim in all but name and he sold the world out to Islamic Terror.